Anmol Publications Pvt. Ltd., 2002. Hardcover. New. In the twenty-first century, terrorism is no longer a marginal and localized problem for our governments, but has become a major security priority. Terrorism today is all-invasive-every day, throughout the world, bombs are set off for a thousand different reasons; it has also, however, dramatically changed from its past forms. As such terrorism has emerged in multi-faceted forms and dimensions-religious, state, revolutionary, and narco etc. The monster of terrorism is taking world population into its grip. Recent terrorist attacks on America show a strange twist in terrorism tactics. Terrorists have emerged as more powerful than the mighty nation-states. It is feared (as in one recent interview Osama bin Laden revealed that he has acquired nuclear bomb) that terrorists are having sophisticated weapons of mass destruction including lethal bio-weapons. This encyclopaedic work is designed to bring together the authoritative information on the genesis, manifestations, diversification and psychological causes of global terrorism and its impact on world order in the 21st century. Besides the academic worth, this work in five volumes will be highly useful and informative for the social scientists, policy planners, judicial and police officials, diplomats and general readers. Printed Pages: 1574. 1996-08-09. New. Ships with Tracking Number! INTERNATIONAL WORLDWIDE Shipping available. Buy with confidence, excellent customer service! 2013-05-08. New. Ships with Tracking Number! INTERNATIONAL WORLDWIDE Shipping available. Buy with confidence, excellent customer service! Marg Publications, 2007. First edition. Hardcover. New. 25 X 30 cm. An important study of James Tod`s collection of Mewar painting, equestrian portraits and coins in the Royal Asiatic Society and his role in and importance to the historiography of Rajasthan. James Tod served with the East India Company in central and western India from 1799 to 1822, and most notably from 1818 as the Company`s ""Resident"" or political representative at the Rajput courts. He took the opportunity to make a detailed study of the region`s history with its dominant Rajput clans and their mythic origins up to his own time. Tod amassed a vast collection of religious and historical manuscripts, ancient coins, old and new miniature paintings, and commissioned drawings of the many sites he visited. He used all this material for his major work, entitled Annals and Antiquities of Rajasthan, which is still widely regarded as the fullest and most significant history of the region ever published. The coin collection in the Royal Asiatic Society is explored here along with the relation of the methods and language of the Annals to both Western and contemporary Rajasthani intellectual trends as well as Tod`s view of the Rajputs and the legacy of his interpretation. The book carries an account of Tod`s use of a crucial Rajasthani text, the Prithviraj Raso. Printed Pages: 136. Viva Books Private Limited, 2010. First edition. Hardcover. New. The Encyclopedia of Understanding Alcohol and Other Drugs offers the most up to date coverage on the persistent and widespread epidemic of drug and alcohol abuse. This now A to Z set is a vital resource for the twenty first century. Printed Pages: 1120. Deep & Deep Publications Pvt. Ltd., 2008. Hardcover. New. Development of Women has been receiving attention of the government right from the very 1st plan (1951-56). But the same has been treated as a subject to welfare. The shift in the approach from welfare to development of women could have taken place only in the 6th plan (1980-85). Accordingly, the 6th plan document adopted a multi-disciplinary approach with a special thrust on three core sectors of health, Education and employment. The 7th plan Model had followed suit. The 8th plan (1992-97) with a human development as a major focus, played a very important role in the development of women. The 9th plan (1997-2002) made significant changes in the Conceptual strategy of planning for women. The process of Empowerment of women initiated during the 9th plan period has been continued in the 10th plan period also for empowering the women on a strong platform for action with definite goals, targets and time-frame. New Measures for Gender empowerment and Equity will be Essential Components of the llth plan (2007-12). Printed Pages: 784. Yoga Publications Trust. PAPERBACK. 8186336044 Like New Condition. . Fine. Yoga Publications Trust. PAPERBACK. 8186336044 New Condition. . New. 2013-05-08. Good. Ships with Tracking Number! INTERNATIONAL WORLDWIDE Shipping available. May not contain Access Codes or Supplements. May be ex-library. Shipping & Handling by region. Buy with confidence, excellent customer service! 1996-08-09. Good. Ships with Tracking Number! INTERNATIONAL WORLDWIDE Shipping available. May not contain Access Codes or Supplements. May be ex-library. Shipping & Handling by region. Buy with confidence, excellent customer service! Agam kala Prakashan, 2004. First edition. Hardcover. New. 19 x 25 cm. Conservation Of Artifacts Is The Need Of The Hour But Equallyimportant Is Its Scientific Study To Understand Better The Materials Used Tomake Artifacts, Their Decay Process, Their Method Of Making, By Recording Theirpresent State Of Preservation Through Scientific Photography Using Combinationof Visible Lighting Procedures Besides Using Invisible Radiations Such As Uv,Ir And X-Rays To Record Even What Is Not Seen By The Naked Eye. Variouscomponents Of An Artifact Can Be Analysed And Identified By Using Conventionalmethods Of Analysis Or Instrumental Analytical Techniques Especially The Non-Destructive Techniques Using Latest Strides Made Byscience And Technologyover The Last Century. Scientific Aspects Of Heritage Study Makes A Deep And Detailed Study Of Thevarious Techniques Used In The Conservation Process. Various Dating Technique Ofrelative And Absolute Dating Have Also Been Described In Detail. Prospects Ofresearch On Material Sciences And Better Conservation Techniques Has Also Beendealt, Highlighting Some Of The Studies That Have Been Done In The Recent Past. Collaboration Ofvarious Institutes (Research As Well As Functional Repositories) Like Museums,Achievesand Archaeological Departments Has Also Been Suggested In The Interest Of Artifactsabout History Of Arts And Sciences As Related To Out Ancient And Modern Artworks. Printed Pages: 196. Munger, India: Yoga Publications Trust (Bihar School of Yoga), 2010 Recognised internationally as one of the most systematic yoga manuals available today. Since its first publication by the Bihar school of Yoga in 1969, it has been reprinted thirteen times and translated into many languages. It is the main reference text used by Yoga teachers and students of Bihar Yoga - Satyananda Yoga within the International Yoga Fellowship Movement, and many other traditions as well. This comprehensive text provides clear illustrations, step by step directions and details of chakra awareness. It guides the practitioner or teacher from the simplest to the most advanced pratices of the hatha yoga system. A therapeutic index is included for use by doctors and yoga therapists incorporating recent information from research into yoga. This edition successfully brings the exposition of Yoga practices to the standard of a university text. Printed Pages: 565.. Fourth Revised Edition. Paperback. New. 14 x 22 Cm. Sangeet Natak Akademi & Hope India Publications, 2009. 5th or later edition. Hardcover. New. 19 x 25 cm. The book contains within its covers contributions from some of the most notable figures in Indian film industry of the early post-independence period, B.N. Sircar, S.S. Vasan, V. Shantaram, Debaki Bose, Bimal Roy, Khwaja Ahmed Abbas, Devika Rani, Prithviraj Kapoor, Anil Biswas, Dilip Kumar, Nargis Raj, Raj Kapoor, Durga Khote, David Abraham, to name only a few personages. Printed Pages: 338. Yoga Publications Trust. Softcover. New. 15 x 23 cm. Printed Pages: 575. Yoga Publications Trust. Softcover. New. 15 x 23 cm. 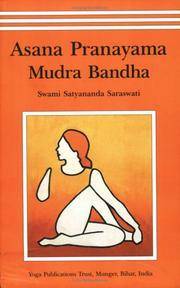 Asana Pranayama Mudra Bandha is recognized internationally as one of the most systematic yoga manuals available today. Since its first publication by the Bihar School of Yoga in 1969, it has been reprinted seventeen times and translated into many languages. It is the main reference text used by yoga teachers and students of BIHAR YOGA or SATYANANADA YOGA within the International Yoga Fellowship Movement, and many other traditions as well. This comprehensive text provides clear illustrations, step by step directions and details of Chakra awareness. It guides the practitioner or teacher from the simplest to the most advanced practices of the hatha yoga system. This book successfully brings the exposition of yoga practices to the standard of a university text. Printed Pages: 554. Shubhi Publications, 2004. First edition. Hardcover. New. The book was originally published as Gwalior 1905, as it was a narrative of the official visit of their Royal Highnesses the prince and princess of Wales to Gwalior in the year 1905. The book was written at the request of his Highness the Maharaja Scindia who was desirous of placing on record some detail an event unique in his experience and abounding in pleasant memories. The title of book was changed, because it is just not a study of the visit of their Royal Highnesses the prince and princes of Wales but the study in depth about the historical Gwalior and the pride of palace of Scindiaâs who ruled over it for centuries. It also gives us the idea of the life of the people, their culture, their crafts and their arts during that period and influence of Scindiaâs. Till today Gwalior and Scindiaâs are synonioms. Printed Pages: 113. Wiley India Pvt. Ltd., 2010. Softcover. New. This book explains the principles and practice of Web services to students of computer science and developers of modern software systems. It presents the necessary concepts, architectures, theories, techniques, standards, and infrastructure to employ Web services for software systems. The book includes a comprehensive overview of the state-of-the-art in Web services and related disciplines. However, its main strength is in how it presents the intellectual underpinnings of Web services, drawing from disciplines such as databases, distributed computing, artificial intelligence, and multi-agent systems for techniques and formalisms. Ideas from these disciplines are united in the context of Web services and service-based applications. Contents:- Preface. Note to the Reader. Acknowledgments. Figures. Tables. Listings. I Basics. 1. Computing with Services. 2. Basic Standards for Web Services. 3. Programming Web Services. 4. Enterprise Architectures. 5. Principles of Service-Oriented Computing. II Description. 6. Modeling and Representation. 7. Resource Description Framework. 8. Web Ontology Language. 9. Ontology Management. III Engagement. 10. Execution Models. 11. Transaction Concepts. 12. Coordination Frameworks for Web Services. 13. Process Specifications. 14. Formal Specification and Enactment. IV Collaboration. 15. Agents. 16. Multiagent Systems. 17. Organizations. 18. Communication. V Solutions. 19. Semantic Service Solutions. 20. Social Service Selection. 21. Economic Service Selection. VI Engineering. 22. Building SOC Applications. 23. Service Management. 24. Security. VII Directions. 25. Challenge and Extensions. VIII Appendices. Appendix A: XML and XML Schema. Appendix B: URI, URN, URL and UUID. Appendix C: XML Namespace Abbreviations. Glossary. About the Authors. Bibliography. Index. Printed Pages: 588. Yoga Publications Trust. PAPERBACK. 8186336044 **LIKE NEW** Ships Same Day or Next! . Fine. Bihar School Of Yoga. PAPERBACK. 0949551147 **BRAND NEW** Ships Same Day or Next with tracking number! . New. Bihar School Of Yoga. PAPERBACK. 0949551147 *LIKE NEW* Ships Same Day or Next! Ships From Springfield, VA USA! . Fine. Yoga Publications Trust, 2002. Third revised edition, xii, 553p, text illus. Trade paperbound, smyth sewn, with minor bump at top of spine and top front corner, otherwise as-new. Bihar School of Yoga text. Yoga Publications Trust, Munger, Bihar (Bihar School Of Yoga), 2013. Rep.. Paperback. New. Special 30% discount on this book. Yoga Publications Trust. PAPERBACK. 8186336044 Item in acceptable condition including possible liquid damage. As well, answers may be filled in. Lastly, may be missing components, e.g. missing DVDs, CDs, Access Code, etc. . Fair. Bharatiya Vidya Bhavan, 2003. 3rd edition. Hardcover. AsNew. 16 x 24 cm. ââ¦.The present volume covers the momentous period 1905-1947. It gives a detailed account not only of political developments, but also of such other essential topics as administration, art and literatureâ¦.â âUnique in the annals of modern Indian scholarshipâ¦â Printed Pages: 1176. D.K. Printworld (P) Ltd., New Delhi, 2004. 2nd edition. Hardcover. New. 15 x 23 cm. Hinduism is not just a religion. It synonymizes the five-millennia of India`s cultural heritage. Which is unequivocally manifest in the Hindus` architecture, sculptural art, music, mythology, Sanskrit literary classics, social institutions, and ethical/legal codes. And also in their complex philosophical systems addressing perpetually baffling questions concerning creation, existence, cosmic consciousness, reincarnation, and the like. Yet, ironically perhaps, not many know about the striking breakthroughs of Hindu sages in astronomy, mathematics, chemistry, medicine, metallurgy, and other ancient-time sciences-leave alone a deficient awareness of the monumental treatises of Charaka, Aryabhatta, Bhaskara and Kautilya that still remain as landmarks in the scientific history. Here is a book trying to highlight how Hinduism of yore : both in its motivations and methodology, laid the foundations of modern scientific quest. Drawing on the prodigious mass of Vedic/post-Vedic Sanskrit writings, the author focuses specially on some of the contemporary scientific ideas vis-a-vis the achievements of the old-world Hinduism in cosmogony, astronomy, meteorology and psychology. Contextually, Iyengar`s book also unfolds the Hindu worldviews of creation, soul and determinism, among other fundamental philosophical concepts. Discerning readers will find Hinduism and Scientific Quest as much a useful read as the scholars of traditional Indian philosophy and history of science. Contents Preface 1. Introduction 2. Cosmogony 3. The Upanisadic Conception of Creation and Modern Science 4. The Role of the Gods 5. Science, Modern and Ancient 6. Advaita and Science 7. Determinism 8. Soul and Body Printed Pages: 293. Munger, Bihar, India: Bihar School of Yoga, 1999 Sections include Asana - Beginners, Intermediate, and Advanced; Pranayama; Bandha; Mudra; and Shatkarma. Covers worn, with some scuffing and scratches, as well as rubbing along the edges. There is a 1/4" tear in the top edge of spine, as well as a small chip and small tear in the lower edge of spine. Pages are clean. 543 pages. . Revised Edition. Paperback. Very Good. 5 1/2 x 8 1/2 ". New Age International (P) Limited, 2010. First edition. Hardcover. New. What does Google`s management of billions of Web pages have in common with analysis of a genome with billions of nucleotides? Both apply methods that coordinate many processors to accomplish a single task. From mining genomes to the World Wide Web, from modeling financial markets to global weather patterns, parallel computing enables computations that would otherwise be impractical if not impossible with sequential approaches alone. Its fundamental role as an enabler of simulations and data analysis continues an advance in a wide range of application areas. Scientific Parallel Computing is the first textbook to integrate all the fundamentals of parallel computing in a single volume while also providing a basis for a deeper understanding of the subject. Designed for graduate and advanced undergraduate courses in the sciences and in engineering, computer science, and mathematics, it focuses on the three key areas of algorithms, architecture, languages, and their crucial synthesis in performance. The book`s computational examples, whose math prerequisites are not beyond the level of advanced calculus, derive from a breadth of topics in scientific and engineering simulation and data analysis. The programming exercises presented early in the book are designed to bring students up to speed quickly, while the book later develops projects challenging enough to guide students toward research questions in the field. The new paradigm of cluster computing is fully addressed. A supporting Web site provides access to all the codes and software mentioned in the book, and offers topical information on popular parallel computing systems. Printed Pages: 396. Jaypee Brothers Medical Publishers (P) Ltd., 2009. First edition. Softcover. New. 15 x 24 cm. Printed Pages: 368. Softcover. Brand New, Perfect Condition, allow 6-9 business days for standard shipping. To Alaska, Hawaii, U.S. protectorate, P.O. Box, and APO/FPO addresses allow 6-20 business days for Standard shipping. No expedited shipping. Choose expedited shipping for superfast delivery 4-8 business days . Over 3, 000, 000 happy customers. 100% Customer satisfaction guaranteed! Please feel free to contact us for any queries. Yoga Publications Trust, Munger, Bihar (Bihar School Of Yoga), 2006. Softcover. New. Special 30% discount on this book. Munshiram Manoharlal Publishers Pvt. Ltd., 1980. First edition. Hardcover. New. 15 x 23 cm. Despite the great geographical distance Indians and Hungarians, visiting each others country often experienced a feeling of congeniality and kindredship. This small book tries to analyse the historic background and origins of these feelings and attempts a factual survey of the efforts of Hungarian scholars, writers and artists to understand India, Indian literatures, arts and religions. Besides giving a detailed history of Indian studies in Hungary, well documented with the help of a rich bibliographical selection of books and papers from the beginning of modern Indian studies upto recent times, the book tries to show the intellectual background to these works, specially by surveying those works of the Hungarian literature which relate to India in their subject or philosophical content. Due consideration is given to contacts in the world of art as well. A separate section gives an almost complete bibliography of Indian literary works translated into Hungarian. Printed Pages: 100. Wiley India Pvt. Ltd., 2005. Paperback. New. The book contains chapters on mechanics that are spread throughout the text to prevent boredom and give students sufficient time to practice writing. Each of these chapters includes a 100-word spelling list based on Ober`s published research of the most frequently occurring as well as the most frequently misspelled words in business writing. The book includes extensive examples that illustrate each rule of grammar and end-of-chapter summaries provide students with a convenient review of these rules. It also includes end-of-chapter exercises that steadily progress from simple to more complex activities, continuing to challenge and engage students throughout the text. Contents:- Part I. 1. The Language of Business 2. Sentences 3. Commas and Semicolons Part II. 4. Verbs 5. Subject-Verb Agreement 6. Punctuation: Other Marks Part III. 7. Pronouns 8. Adjectives and Adverbs 9. Capitals and Abbreviations Part IV. 10. Prepositions and Conjunctions 11. Plurals and Possessives 12. Number Expression Part V. 13. Compound Words 14. Word Confusions 15. Spelling Printed Pages: 0. Orient BlackSwan/ Universities Press, 2000. Softcover. New. Learning for Earning is certainly about increasing your market rate, but it is also about earning the freedom to make choices about the type of work you do. Today, lifelong learning isnât merely a catch phrase but a must if you want to keep ahead â and if you donât take charge of your own learning, frankly, no-one else will. This book provides the inspiration and practical help to show you how to: â¢ find out about yourself â your skills, your relationships and what you really want out of work â through simple self-assessment activities â¢ discover how you learn best and ways to accelerate your learning â¢ balance âlearning timeâ with other pressures â¢ remember what youâve learnt and find the support to keep up good learning habits â¢ apply the rule of simplicity to ensure you set achievable goals with lasting effect. Printed Pages: 96. Pustak Mahal, 2013. Softcover. New. Effective Office Communications Noting & Drafting in English & Hindi Communication is like a soul in life. Without communication there is no life. We need communication which is understandable and clear to the recipient. This book aims at making the readers experts in skilled and effective communication. It lays special emphasis on Noting and Drafting. Notes and Drafts are pieces of writing whose effectiveness depends on the writing skills of the writer. Follow the ways and tips to get equipped with the skill of effective writing. It is based on the knowledge and personal experience acquired by working in government and public organisations for decades. Printed Pages: 179. Atlantic Publishers & Distributors (P) Ltd/Northcote House, 2010. Softcover. New. Printed Pages: 112. Advaita Ashrama. Softcover. New. 10 x 16 cm. Education is hardly edifying without provision for character. Character-transmission is the essential mission of education. Those who give their children everything in the world, but fail to give character, give them `stone` in place of `bread`. This small booklet briefly delineates the means of attaining this crucial and vital aspect in the course of human development. CONTENTS: Publisher`s Note to the Fifth Edition Publisher`s Note to the Second Edition Preface 1. The Irony of Enduring Dams and Brittle Men 2. Man the Clever Undoer of Himself 3. Character : The Crucial Need of Man 4. Wanted : Enough Character to Go Round 5. Character Can Achieve Everything 6. How to Build Character 7. Helpful Disciplines for Building Character 8. A Well Regulated Life : The Secret of Character 9. Character and Conduct 10. Perfection of Character Printed Pages: 56. Aditya Prakashan, New Delhi, 2008. Softcover. New. 14 x 22 cm. Panini`s concept of zero replacement is regarded as one of his greatest achievements by scholars of Sanskrit as well as linguists. In a highly technical language he established various kinds of zero, differentiating them with regard to the scope of their application and their effect on the remaining word forms. Ths booklet is the first systematic collection, analysis and classification of all occurrences of zero replacement in the Astadhyayi. Printed Pages: 66. Amar Chitra Katha/ACK Media, 2008. Softcover. New. The sixth century BC was a watershed period in the history of India. The north of India then was politically fragmented, with a number of kingdoms and perhaps a few republics. It was Bimbisara, the Emperor of Magadha, who for the first time brought these kingdoms together under the rule of a single authority. This was further consolidated by his son and successor, Ajatashatru. This account of their life and times has been reconstructed from references, sometimes divergent, from Buddhist and Jain Literature. Both the sources claim the two kings as adherents of their respective faiths. Printed Pages: 32.